Share links: Dana or Dana Beal or danabeal or DanaBeal. This article was written by Timeshifter. See Facebook: Dana Beal and Free Dana Beal, Free Ourselves. See docs. Dana Beal is the founder and main organizer of the Global Marijuana March . See Wikipedia: Dana Beal and Wikipedia: Global Marijuana March. See Google images, Bing images, and Youtube videos. See: New York City. Dana Beal speaking at Jan. 11, 2018 public hearing of New York State Assembly concerning the Marijuana Regulation and Taxation Act. Dana Beal Interview. By Saira Viola. August 25, 2016. International Times. Many photos. And: Re Occupy The Yippie Museum. See Facebook. Youtube: Saving history. 420 and Global Marijuana March event lists by year. See also: Featured crowd photos for Global Marijuana March. Yippie Museum and Cafe at 9 Bleecker St, New York City. Facebook: Yippie Museum-9 Bleecker Street. Dana Beal. 7 Oct 2014 in Washington Square Park in New York City. .
2014, Feb. 12. Dana Beal is released on parole.  .
2013, Aug. 9. Moved to work release center in Omaha, Nebraska . 2013, June 7. Surgery for a completely blocked carotid artery. 2013, May 20. Letter from Ron Kuby to Nebraska Parole Board re: Irvin Dana Beal. 2013, May 4. YouTube: Dana Beal from Prison at the NYC Cannabis Rally. Video of the crowd at the New York City Cannabis Parade while Dana Beal spoke to them from prison. 2013, April 25. Letter from Dana. 2013, March 6. Moved from Wisconsin back to Nebraska. 2013, Feb. 17. Dana's letter "Time to Re-assess", written previously. It is also in French. 2013, Feb. 14. Surgery to repair his double hernia. 2013, Jan. 9. Dana turned 66 in prison in Wisconsin. 2012, Dec. 26. Moved from Nebraska back to Fox Lake Correctional Institution in Wisconsin. 2012, Aug. 27. Bench trial in Nebraska. Found guilty Sep. 4. 2012, Feb. 24. Another heart attack. Stent placed in coronary artery. 2012, Feb. 15. Back in prison in Wisconsin. 2011, Dec. 29. Wisconsin resentencing hearing. 2011, Sept. 27. Heart attack, induced coma for 6 days, double-bypass open heart surgery. Released temporarily from his Wisconsin prison sentence.  .
2011. Sept. 22. Sentenced in Wisconsin. 2011. Jan. 6. Arrested and jailed in Wisconsin. . Copy of Dana Beal's Facebook comment Dec. 3, 2011. Before there was needle exchange, there was harm reduction: the movement to separate marijuana and hard drugs. We started that in the sixties! There's really no way of telling how many lives were saved because of the cultural establishment of a norm, but a lot of people wound up not needing to exchange needles to begin with. In December, 1980, with Howard Lotsof, I initiated the development of ibogaine as the first broad spectrum treatment for heroin and opiates, methamphetamine and crack/cocaine, alcohol and cigarette addiction that was an "interrupter", not a maintenance drug like methadone. In other words, as any aficionado of Law and Order SVU B.D.Wong can tell you, ibogaine eliminates heroin addiction with a single dose. What good did he do? It is estimated that roughly 10,000 people have been treated with ibogaine worldwide. According to Dr. Ken Alper of NYU, 69 percent of these were for substance abuse, 56 % were for opiates. Ibogaine is winning acceptance in dozens of countries. After I visited New Zealand and established that ibogaine works by expressing a growth factor, GDNF, that regenerates dopamine receptors, NZ Medsafe scheduled ibogaine as a prescription drug. In other words, we found the Beatnik Holy Grail, the substance Allen Ginsberg and William Burroughs were looking for when they went to the rain forest in 1959. I think that makes the Yippie! Museum part of the History of the Village. Dana Beal was the main organizer of the Global Marijuana March until he was incarcerated again in February 2012. He is also a world-renowned activist concerning iboga and ibogaine and its use in alleviating the devastating effects of heroin withdrawal, and the severe withdrawal symptoms when stopping use of other hard drugs such as methamphetamine. See Wikipedia: Dana Beal. His Nebraska sentencing was on Monday, December 10, 2012: Nebraska burns Beal; Gives pot activist 4 to 6 in the joint. By Paul DeRienzo, The Villager. See also: Yippie activist sentenced, gets prison time for hauling pot. By Paul Hammel, Omaha World-Herald. See also: Marijuana advocate jailed, on KETV Omaha. His prosecutor was fined in August 2012 for around $5000 worth of false personal expense reimbursement claims. See this Facebook group for more info: Free Dana Beal, Free Ourselves. Dana's Facebook page is here, though he can't update it himself while he is in jail. Others are updating it. 1994. Dana Beal marches at the head of the 1994 New York City Marijuana March. This was before the Global Marijuana March began in 1999. Mark Twain. He smoked hashish. See also: Influential cannabis users. Quote: "Education consists mainly in what we have unlearned". The Nebraska jail system may have been trying to kill Dana Beal. December 2, 2012 letter from Dana Beal: "I was lying on my back and coughed just once, and got the most excruciating pain from my right hernia. Since previously I had to move around to get stabbing pain, this means my large intestine is really trying to burst through my abdominal wall." November 21, 2012 letter: "After walking 'round the yard for 45 minutes, I came in, lay down on my bed, coughed just once -- and got the worst, most excruciating stab of pain that you can imagine in my right hernial sac." Nov. 18, 2012 letter: "The growth on my back is getting bigger, but she won't order a biopsy, and there will be no hernia operations." One week after returning to prison this past February 2012, he had another heart attack and a stent had to be placed. He has other serious medical issues, such as an acutely painful double hernia described above, which are not being addressed in prison. In addition, he is taking a blood thinner, which is not being properly monitored. Therefore, theoretically, the hernia could rupture and Dana could bleed out and die before help arrives. November 21, 2012 letter from Dana Beal. November 18 and November 21, 2012 letters. For info on helping or contacting Dana Beal go here. The contact info is updated as Dana is moved around. On Monday, October 29, 2012 Dana was moved to a Lincoln, Nebraska facility for a health assessment. Dana was at the Wahoo, Nebraska jail before that. Jailhouse Letter: Dear Judge, ‘The Staff Actually Discontinued My Fish Oil’. By Corey Kilgannon. August 17, 2012. New York Times. It took 2 weeks, but Dana got the fish oil. See comment at the end of this article by The Villager from August 30, 2012: Beal pleads guilty, but med defense not up in smoke. By Paul DeRienzo. Dana Beal had a bench trial in Saunders County, Nebraska on August 27, 2012, and was found guilty September 4. See media articles:      , and Dana's reply. On September 27, 2011 Dana suffered a heart attack which resulted in double-bypass open heart surgery. He survived and was released temporarily from his Wisconsin prison sentence mentioned farther down. See: Activist Legend Avoids Marijuana Sentence -- With Heart Attack. On December 29, 2011 his resentencing hearing gave him 11 months in prison. That sentence started in February 2012. See this and this. On September 20, 2011 Dana Beal was sentenced to 2 and a half years in prison in Wisconsin. He was credited with 267 days already served for the time he was in jail. His original sentence also included parole for 2 and a half years after he got out of prison. See this September 22, 2011 article by The Dodgeville Chronicle. See also Paul DeRienzo's reply and Dana's reply to Dana Beal a folk hero? in The Villager, December 1, 2011. Dana Beal photo albums on Facebook:  . For more photos see this Google image search. Click the images below for info, larger sizes, and sharing. September 1989. Jack Herer and Dana Beal. Great Midwest Marijuana Harvest Fest in Madison, Wisconsin. .
"May Day is Jay Day. Ninth annual Central Park Smoke In and Parade. 1976." Saturday, May 1 in New York City. Centerpiece of the April 1976 issue of Yipster Times. Image info. Aron (Pieman) Kay on the left, and Dana Beal on the right. Rock Against Racism event, Central Park Bandshell, in New York City. Saturday, May 5, 1979. Aron's t-shirt says "Have Pie, Will Travel". .
"this pic was taken by wayne angel at the 1978 national marijuana day smoke-in at nyc's central park — with Stephen DeAngelo, AJ Weberman, Dana Beal and Aron Kay." (left to right in the photo). Dana Beal and Steve Conliff. 1977 NORML Formal. More info on this photo here. Patti Smith  in Mar-Apr 1977 edition of The Yipster Times . Dana Beal in 1973 working on the The Yipster Times . Dana Beal and William Kunstler in the 1970s. New York City. Feb. 4, 1972. Dana Beal Benefit Boogie. See another flyer. He was in jail in Madison, Wisconsin. Peter Bramley artwork advertising the Dana Beal Benefit Boogie. Some history. Also, some excerpts from I, Doll: Life and Death with the New York Dolls, by founding bassist Arthur Kane. See relevant book excerpt. Facebook post sharing the above article. Intro: "According to the late New York Dolls bassist Arthur Kane, the Dolls' first gig was a 1972 fundraiser for Dana Beal." See Wikipedia: New York Dolls. From The Archives -New York Dolls- Concert Chronology / Gigography/ Timeline. See 4 Feb 1972 section. 1971. Madison, Wisconsin. 1st Annual Marijuana Harvest Festival. September 25. The first Great Midwest Marijuana Harvest Festival: Sept. 25, 1971. . October 1, 2010 article by Gary Stork. "At that time, Dana was in jail in Madison charged with several counts of sales to a narc and also charged with possession with intent. In the end, he copped a plea and served about a year in the Dane County jail. William Kunstler, legendary lawyer for radicals, was willing to serve as his defense lawyer but the case didn't ever come to trial. I sure didn't think Dana Beal would still be facing time in prison 40 years after 1971." The Marijuana Review. July-Sept 1971. September 25, 1971. Madison, Wisconsin. 1st Annual Marijuana Harvest Festival. .
A History of Tompkins Square Park. Link goes directly to section titled: The 1960's and 'The East Village'. See Wikipedia: East Village, Manhattan. Free Weed: Episode 77. Mar 13, 2015. "This week's interview is with longtime marijuana activist and Yippie founder Dana Beal". It starts at 24 minutes 35 seconds into this episode. Direct link to SoundCloud audio. "The first Smoke In was held in February 1967 in upstate New York by Michael Aldridge but it did not receive much press attention. In June 1967 Dana Beal and the New York Provos held the second smoke-in in Tompkins Square Park [in New York City]. Due to several arrests this demonstration received considerable press. Beal went underground in January 1968 but the Smoke Ins continued just as they do today as evidenced by the above photo of 10,000 Smoke Inners in Boulder on April 20, 2008." "Hippies Protest In NYC". Video of August 23, 1967 rally. "Carrying guitars and beating drums, hippies and supporters of Yippie activist Irvin Dana Beal gather in New York City to protest his arrest for selling drugs and to raise money for his bail." There is no audio. QuickTime may need to be installed to play the embedded video, or download the video via the link there, and play it on your media player. "Antigone," a documentary in progress, Includes Wisconsin Sentencing. It is at the beginning. "Antigone," a documentary in progress, Includes Wisconsin Sentencing. Newer version. It is at the beginning. Hippies protest Dana Beal's arrest in NYC 1967. Video with timecode and more of the rally. "When Dana got popped for acid in 1967 the whole summer of love community came down to the federal courthouse and carried him on their shoulders when he got out on the community bail fund." Dana Beal in 1967 in New York City. Dana Beal in 1967 in Tompkins Square Park in New York City. Dana is 20 years old, and is wearing the white striped shirt. There are many videos with Dana Beal in them. Google search for videos: Dana Beal. YouTube search for Dana Beal. "Antigone," a documentary in progress. YouTube link. This version includes some of the Wisconsin sentencing. This video shows much of Dana's work, in order to put his current situation in context. Video changes to full-screen, high-definition quality around 1 minute 10 seconds in. That is Dana being held up by others in the 1967 rally videoclip shown at the beginning. Dana Beal's entire sentencing testimony. September 20, 2011. 36 Minutes: YouTube link. The Ibogaine Story: Report on the Staten Island Project. 1997 book by Paul De Rienzo, Dana Beal, and Project Members. Publisher: Autonomedia. ISBN 978-1-57027-029-1. Chapter 4 is titled "Dana Beal" and is a biography of him. Text online here, here, and here. On Mindvox. Full text of book online. On Drugs Forum. Full text of book online. On Amazon. Can search text. On Google Books. Can search text. Dana Beal - New York. Articles in Village Voice. Irvin Dana Beal. American Folk Hero. The New Face of Yippie. 9 Bleecker, Hip, Hopping and Happening. By Preston Peet. March 27, 2012. HighTimes.com. 2012 Global Marijuana March banner. A Yippie on Familiar Turf, Both in New York and in Jail. January 20, 2012. By Corey Kilgannon. New York Times. Facebook: Sentencing Hearing for Dana Beal. September 20, 2011 in Wisconsin. Facebook: Aron Kay. Aron has info on Dana Beal when Dana is in jail or prison. Pot activist still in the joint: ‘It was all medical marijuana’. By Lincoln Anderson. The Villager. March 3 - 9, 2011 issue. Help Beal make bail. Scoopy's Notebook. The Villager. June 16 - 22, 2011 issue. Drug War POW: Dana Beal | Cannabis Culture Magazine. May 5, 2011 article. An interview with (Irvin) Dana Beal by Michal Rehak of Legalizace Magazine, Czech Republic. Also here and here. See GlobalCannabisMarch.com and the Incarcerated page. It has info on how to help Dana Beal. Dana Beal Update: New York Marijuana-Reform Activist Still in Wisconsin Jail. CelebStoner.com, February 13, 2011. See January 10 article also. Dana Beal busted again. The Villager. January 13 - 19, 2011 issue. Counter-culture 'yippie' with Madison ties in jail on pot charges in Iowa County. By Todd Finkelmeyer. The Capital Times, Jan. 14, 2011. Read the news ... oh, boy. Detroit Metro Times. By John Sinclair. Feb 2, 2011. John Sinclair discusses Dana Beal in the last part of the article. Facebook: Free Dana Beal; Release Ibogaine in the Midwest. "Omahan: Drug breaks meth's grip." 2. By Paul Hammel. July 4, 2010. Omaha World-Herald. 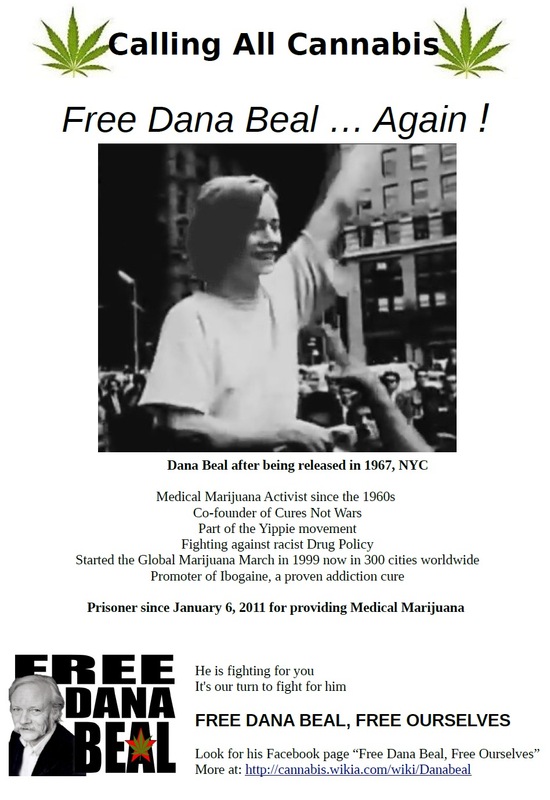 Cyprus IndyMedia: Dana Beal is out of Jail - Freedom for all Friends of Cannabis!. Nov. 8, 2009. DRCnet article on Dana Beal's 2009 arrest in Nebraska. Many links. On September 30, 2009 Dana Beal was arrested in Ashland, Nebraska which is 40 miles away from Omaha, Nebraska. Google News archive searches of media mentioning Dana Beal: "Dana Beal". "Dana Beal" marijuana. Many videos. Google search for videos: Dana Beal. YouTube search for Dana Beal. Free Dana Beal, Free Ourselves. Info on how to help Dana Beal. An email below kept for historical purposes. He calls in to the New York office and to contacts around the country every day. (Keep sending $$ to his lawyer for phone account and defense.) He is still working on getting medical marijuana and ibogaine a public hearing and also rescheduling by the federal government. Anything you can do to help would be useful, e.g., write your congressional representative and ask them to sign on to the letter to DEA Director Leonhardt that is circulating. Or also help support Dimitri Mugianis' defense effort after his bust for ibogaine. Dana is still trying hard to ensure that the posters for this year's event will get printed and sent, though it is almost too late. Call Paul Stanford in Portland Oregon for info. Dana still would like more cities to join the list and put on events. If your city is not on the list preceding this, please e-mail your info, NOW to dana@cures-not-wars.org. Please help Dana out materially. He is going to need funds for legal defense and even for small things like phone calls and personal supplies while he is jail. He would like people to set up PayPal links on their Facebook and web pages to get money to his lawyer.